Behind the French Menu: Murol, Murol du Grand Bérioux, and Murolair. No AOP but Still Among the Tastiest Cheeses in France. Murol, Murol du Grand Bérioux, and Murolair. No AOP but Still Among the Tastiest Cheeses in France. Photograph courtesy of the Fromagerie de Grand-Murols. The names above are used for this mild, creamy, 45% fat yellow cow’s milk cheese made from pasteurized cow’s milk; the cheese is matured for a minimum of five weeks before being sold. 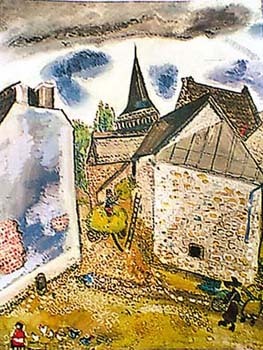 The cheeses were created in the 1930’s by a local cheese maker, Jules Bérioux; his name is still on many of the labels; he just added Grand to his name and made the cheese Murol du Grand Bérioux. 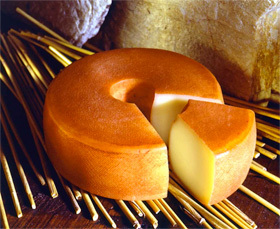 Murol is considered a relatively new cheese despite the cheese being created over 70 years ago. From my experience, the French feel that all cheeses under 200 years old are new. A wedge cut from the Murol cheese. The Murol cheese is easily identified by the hole in its center while the cheese itself is made in discs of 10- 12 cm ( 4” to 4.7”) in diameter weighing an average of 450 grams (1 lb). The hole that is cut from the center speeds the affinage, the maturing process; nothing is wasted and so this plug of cheese, the part cut from the center, is sold separately as a cheese called Murolair, a small 50-gram cheese. Any difference in the taste of these two cheeses are solely the result of the way they mature. The Murol village which gave its name to the cheese is taken from the area’s historical local Lords, the Murols. They once owned the semi-destroyed castle that still stands near Lac Chambon. If you are visiting the area, the Lords of Murol’s castle comes to life again every summer with re-enactments of 13th-century life in its courtyards. 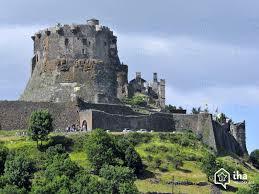 The cheese is produced in the area in and around the villages of Murol and Chambon sur Lac, in the department of Puy de Dôme in the Auvergne. These two villages are next to the incredibly beautiful Lake Chambon. 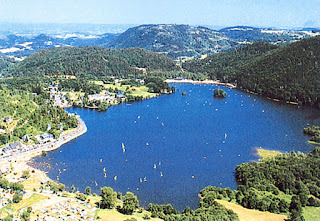 Lake Chambon is an artificial lake that was constructed as part of the Éguzon hydroelectric dam on the Creuse River. When the dam opened in 1926, it was the largest hydroelectric dam in Europe. The lake is now a major summer water sports center with beaches, yachts, pedalos, water-skiing, and the lake is stocked with fish for anglers. The lake's area is 312 hectares (1.2 square miles). 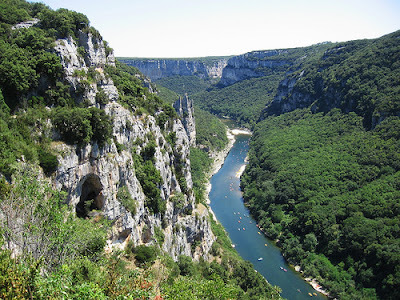 Just 5 km (3 miles) away from the lake is the small town of Saint Nectaire so famous for its cow's milk Saint Nectaire AOP cheese; Saint Nectaire was known as a spa in Roman times. Then 60 km (38 miles) away is the town of Riom-ès-Montagnes the center for the production of Bleu d'Auvergne AOP, the mild, blue, cow's milk cheese. Riom-ès-Montagnes is also a major center for the gentian plant used for homeopathic medicines and France's popular liquor called Suze. Altogether in the region of the Auvergne, there are five AOP cow's milk cheeses: Saint Nectaire AOP, Bleu d’Auvergne, Cantal AOP, Fourme de Ambert AOP, and Salers AOP. In 1-1-2016 the region of the Auvergne was joined with the region of the Rhône-Alpes and become part of the super region of Auvergne-Rhône-Alpes. Together they have 15 or 16 AOP cheeses and at least another 40 delicious cheeses without any suffixes. Among these are cheeses like the Murol which are known and appreciated all over France. For more about buying cheese in France and taking it home click here. Photograph courtesy of New Zealand Fine Prints. 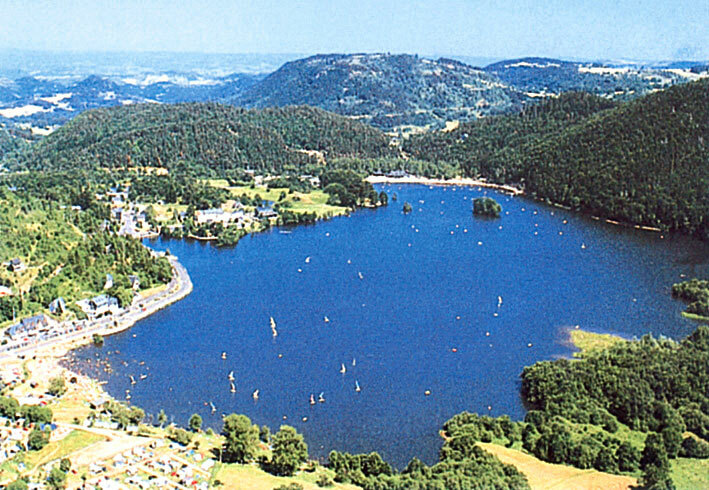 Chambon-sur-Lac is close to the heart of the Regional Natural Volcano Park of the Auvergne. 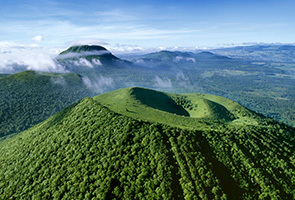 Close by is the highest dormant volcano in France: the Puy de Sancy 1,886 meters (1,17 miles) in height. This is a huge park comprised of outstanding landscapes, fauna, and flora and some 80 extinct Volcanoes. An extinct volcano in the park. Bleu d'Auvergne AOP, - The Bleu d'Auvergne French Blue Cheese. Bleu d'Auvergne in French Cuisine. Fourme d'Ambert AOP - One of the Auvergne's Very Special cheeses. France’s Mainland Regions and Their Borders Have Changed. Keep This List With Your GPS and Map. 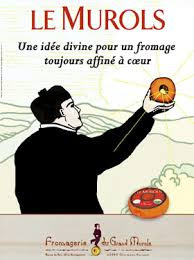 Saint Nectaire Fromage - Saint Nectaire Cheese. Saint Nectaire is an AOP Cow's Milk Cheese from the Auvergne-Rhône-Alpes.